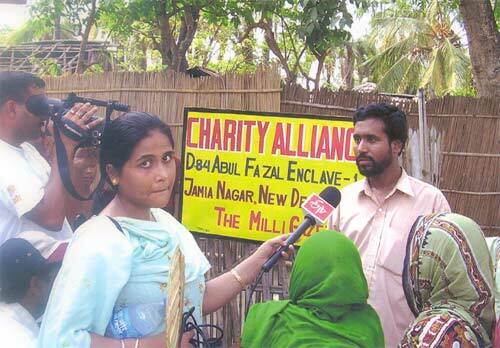 Charity Alliance was established as a trust based in New Delhi in April 2005, as a direct result of the consistent and alarming news about starvation deaths in Murshidabad, a Muslim majority district in West Bengal. River Padma has been steadily eroding village after village in this area rendering farmers homeless and landless. After some initial help, the authorities left the villagers to fend for themselves. Once their lands and homes are destroyed by the river, the villagers move to the Indian side of the river where they erect jhuggies on government or private land. As there are little job opportunities in the area, young and able-bodied people migrate to other areas including Kolkata, Delhi, Mumbai and Surat in search of menial jobs or rickshaw-pulling, while the weak and elderly are left behind to fend for themselves. Thus, starvation deaths became common among these people, belonging to over a dozen of eroded villages and numbering around 25,000 in early 2005. Their numbers have increased since. The local Bengali press was publishing news about these tragic events until a human rights organisation based in Hong Kong picked it up and circulated it to people around the world, including The Milli Gazette which sent a reporter to check the news in March 2005. He confirmed the starvation deaths and the tragic conditions of the victims. This prompted the MG editor too to go to the area soon thereafter. He decided then and there that something must be done urgently. 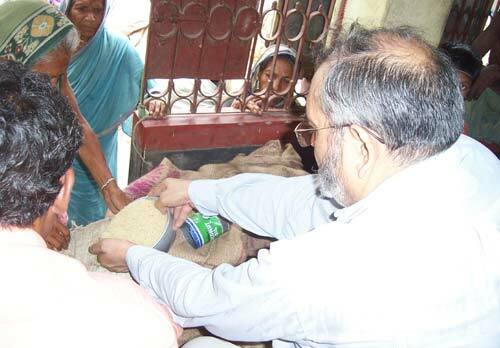 Thus, the programme of distributing ration on a weekly basis started at once in late March 2005 itself, in addition to medical help to the most vulnerable victims. Soon some of them were also offered small amounts of cash to help them stand on their feet, and over a hundred children of the victims were helped to enroll in local schools. Their fees were directly paid to the schools while free textbooks and other necessary items were also supplied to them. To put this effort on a formal footing, a trust called "Charity Alliance" was registered in Delhi (registration No. 6306) on 21 April 2005. An appeal was made through The Milli Gazette, Urdu press in India and via e-letters to well-wishers among the MG fraternity. The response was good and the relief work has continued ever since on a regular basis. 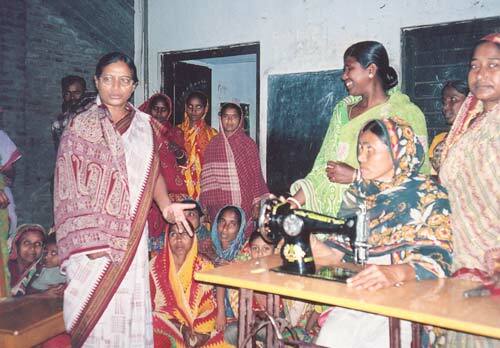 The Charity Alliance initially had two full-time staffers at Jalangi, Murshidabad. Now it keeps only one full-time staffer who takes care of the situation of the victims on a regular basis, and hires helpers locally once a week during distribution of rice which takes place on Tuesdays every week. In the last month of the financial year ending 31 March 2006, the regular number of recipients of ration and other help was 185 persons but it crossed 350 for around three months during monsoon seasons in 2005, and again during the same period in 2006, when many victims are made homeless and forced to take shelter in government buildings like schools. After the monsoon, a re-assessment is made and only most vulnerable are kept on the list. In addition to the regular relief work in Jalangi, Murshidabad, Dr Zafarul-Islam Khan also approached the Supreme Court of India seeking its intervention to rehabilitate the victims by offering them land in lieu of their lost properties. The Supreme Court asked him to approach the West Bengal High Court first before coming to the apex court. However, the Supreme Court directed his petition to the West Bengal Human Rights Commission. 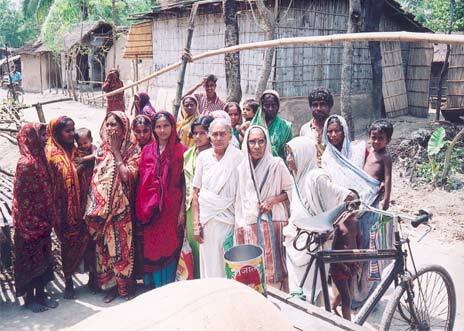 Initially, the Commission, alongwith other West Bengal authorities, did not take the matter seriously and denied the very occurance of starvation deaths despite persistent reports in the local press (some of which has been reproduced in a booklet, Murshidabad Starvation Deaths (New Delhi, 2005, 64 pages), compiled by Dr. Zafarul-Islam Khan, which is also available at http://www.charityalliance.in/contents/2005/pdf-booklet-murshidabad.htm ]. Later in August 2006, Dr. Khan received a communication from the West Bengal Human Rights Commission, dated 27 July 2006 which accepted the occurrence of starvation deaths in the district of Murshidabad but laid the blame on the shoulders of the Murshidabad district authorities. A West Bengal leader, Mr. Shahenshah Jehangir, is preparing to file a PIL in West Bengal High Court seeking orders for the rehabilitation of the Padma river victims in Murshidabad. Since the inception of our work in Murshidabad, Milli Gazette reporters and the editor himself have been visiting the area to take account of the situation and take stock of the relief work. For this, they do not burden the Charity Alliance. All effort is made to avoid any unnecessary expenditure, while the MG offers all required administrative, office and advertising support to this effort free of cost. We are enclosing herewith the audited accounts for the 2005-06 financial year for your perusal, and thank you for general support to this effort. Other details of the work, like the list of relief and medical help recipients, names of students and others helped by the Charity Alliance, are now available on the Charity Alliance website (www.charityalliance.in) where a complete list of the donors is also found. As a way of permanent solution to the problems of the starvation death belt in Murshidabad, we are planning to establish a small vocational centre where victims and other people of the area will learn vocations and crafts required and feasible in the area. The Charity Alliance will also help finance their ventures and assist them in marketing their produce. During the same period (2005-06), the Charity Alliance also offered help on a small scale to some destitute school children in Delhi by paying their fees directly to their school and has also offered help for sanitary work in a Kanjar colony in Nagina, UP, which is a community of outcasts reduced to beggary. Our effort in the future will be to induce these people to enroll their children in schools and the trust will pay their fees directly to their schools. It will also offer free textbooks, uniforms and small amounts of scholarships to the needy children as an inducement for their families to send them to schools. The Charity Alliance has also been surveying poor farmer communities, including Tadvi Pathans, in Haryana, Madhya Pradesh, Rajasthan and Maharashtra where zealots are working for decades for their shuddhi and have been succeeding to some extent. The idea is to sponsor a few children from these villages to study in madrasas and schools outside their area so that they may return and spread light and education in their areas. The annual cost of the education and related expenses of each such child will be around Rs. 18,000 (US$ 393). In May 2006, Charity Alliance also took the lead to launch Palestine Appeal with a view to send relief material to our suffering brothers and sisters in Gaza and West Bank. A number of other organisations, especially in the south, are taking interest in this initiative and we hope to be able to send the relief, mainly medical supplies, to Gaza within this year (2006). Palestine relief is a temporary work of Charity Alliance as its focus will remain on the most disadvantaged people in India. While sending you a copy of the audited report for 2005-06 financial year, I seek your continued support in order to continue this work on a regular and permanent basis to help the most deprived in our community, in order to help them raise their heads and join the civilised society. It is a moral and religious duty of all of us. Charity Alliance has now obtained the necessary tax-exemption under Sections 12-A and 80-G of IT Act. I welcome your help and suggestions and ensure you that every rupee of your donation will be meticulously used for the purposes stated above. All donors are welcome to check our accounts. They are also welcome to visit the affected area in Jalangi, Murshidabad, especially on the ration distribution day which is normally on Tuesdays every week. Our representative there (Mr. Ghulam Kibriya) will be happy to welcome you and explain to you all aspects of our work there.